Posted October 13th, 2014 at 11:47 am. This summer, Class of 2017 members Leqi Liu, Alena Klindziuk, Yilun Tang, and graduate student Xiao Wang went to the Advanced Photon Source of the Argonne National Laboratory outside of Chicago, a massive facility that generates the brightest hard X-ray beam in the Western Hemisphere, to study the magnetic properties of platinum-magnetic insulator bilayer thin films. 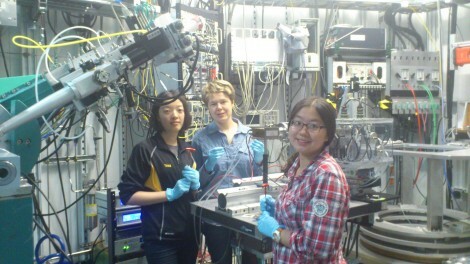 The students are part of Assistant Professor of Physics Xuemei May Cheng’s research group. Also referred to as “nano-spintronics,” the importance of this research is summed up well in an abstract of a 2013 presentation given by Atsufumi Hiohata, University of York, on the Argonne website. Cheng, who held a post-doctoral fellowship at Argonne, is among the leading researchers in the field of spintronics, and she’s also made it possible for Bryn Mawr students to engage in her cutting-edge research. 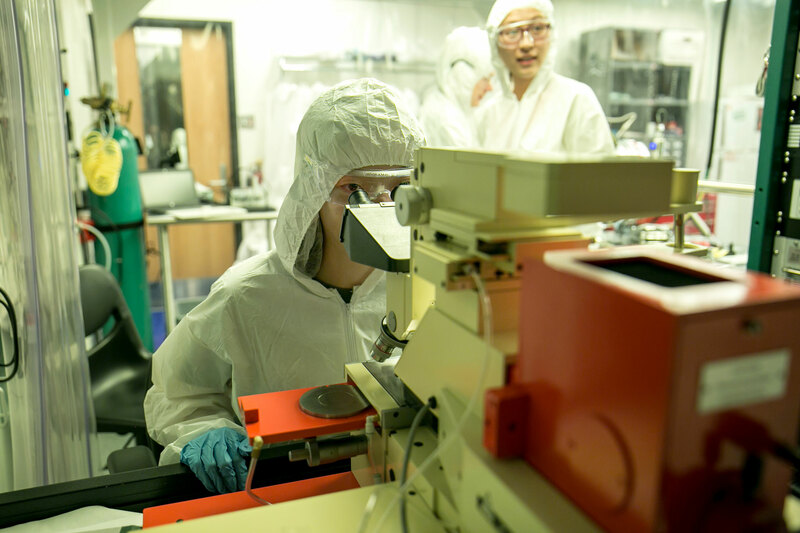 To date, five Bryn Mawr undergraduate students have conducted research at Argonne and Wang has traveled to the lab six times in the last two years. And thanks to about $850,000 in grant funding Cheng has received in recent years from the National Science Foundation, the students can also do research right on Bryn Mawr’s campus in a state-of-the-art nanomaterials research laboratory that’s so advanced it’s used by collaborators from neighboring institutions, such as Villanova University, and the University of Pennsylvania. Most of the students who join May’s research group go on to enroll in engineering programs, many at some of the most prestigious in the nation. Recent graduates have gone to Princeton, Columbia, U.C. Berkley, and U Penn. The success of May’s students is all the more impressive given that many come to Bryn Mawr not even intending to major in physics. Maggie Xiao ’15 came to Bryn Mawr from China with plans to be a medical doctor and to minor in French. As a first-year student she took a Modern Physics Laboratory class taught by Cheng. “I was taking intensive French and still wasn’t sure what I wanted to major in but I was drawn to physics after that class,” said Xiao. In her first three years at Bryn Mawr, Xiao has traveled to Argonne three times to do research. Her trips have been funded by an NSF grant of Cheng’s and through the Summer Science Research program. This summer she went to Rutgers to do research through LILAC summer funding. The Department of Physics at Bryn Mawr College offers an engaging program in physics. In recent years Bryn Mawr College has averaged nine physics majors per year, approximately three percent of the graduating class. This is nearly 50 times the national average for women graduating with undergraduate physics degrees in the United States. For more information, visit the Physics Department website.